In a controversial appointment Mikaele Teofilo has been commissioned as lay pastoral leader in the Samoan chaplaincy in the Wellington Archdiocese. The appointment has not been universally welcomed. Some of the catechists were expecting that an ordained minister would fill the vacancy left by Fr Maleko Api Tufuga’s move to parish-based ministry. However, the Cathedral of the Sacred Heart was packed on Sunday afternoon July 11 with many Samoan people wanting to celebrate Mikaele’s appointment to the role. In preaching on the gospel of the day, the story of the Good Samaritan (Lk10:25ff), Archbishop John Dew said that though it was difficult to forgive and accept, ‘baptism calls us to look for the person who is “half-dead” – not necessarily “half-dead” at the side of the road, but “half-dead” because they do not have enough money to live on, because they have not had the opportunities for education, because they have not been able to develop their prayer life and their relationship with God. The story was not one about a nice bloke doing a good turn, Archbishop John said. As the least likely one to be caring for the victim in the story because Samaritans were outcasts in Jewish society, ‘Jesus is challenging us to be compassionate towards those we find it difficult to get on with, he is challenging us to show charity, always charity’. 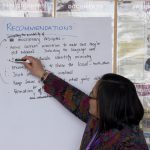 The Samoan Chaplaincy was established to provide pastoral care to Samoan Catholics who are members of the Aulotu in the parishes of the Archdiocese of Wellington. 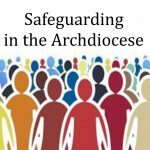 The chaplaincy works closely with parish priests, lay pastoral leaders and schools, as well as educational, pastoral and social services of the archdiocese. Archbishop John said Mika’s appointment had not been welcomed by all, but ‘he has my full support and it is good to know the support of many others as he takes up this role’. Any parish or chaplaincy could be seen to be ‘Good Samaritans’ – to look to the needs of others so that nobody is left ‘half-dead’ at the side of the road as they journey through life. Any priest or lay pastoral leader looks for ways to bring life to the people they are called to serve. All the baptised are called to be ‘good Samaritans’, to be neighbours and to welcome and treat people with charity and compassion. 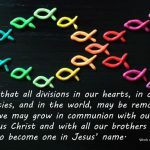 The reading from the letter to the Colossians (1:15-20) said Jesus holds all things in unity, that the church is Christ’s body, that God wants all things to be reconciled and brought to unity in Jesus. 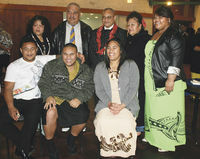 Images: above: The Teofilo family – Michael, Tea (Mika’s wife), Patrick, Sala Sauso’o, a cousin from Auckland, Mika, Anastasia, (youngest daughter), Telesia, (Sala’s wife), Olive. After the ceremony Mika was presented with a traditional chief’s lei, made from the fruit of a Samoan tree. The lei was owned by a high chief, the father of a priest. 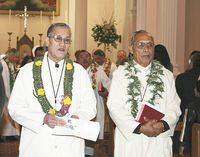 Above right: Catechists Matthew Tuaiao So’otaga and Kololo Pereze who taught Mika at primary school – St Francis Xavier (Vanila) in Moamoa, Samoa.